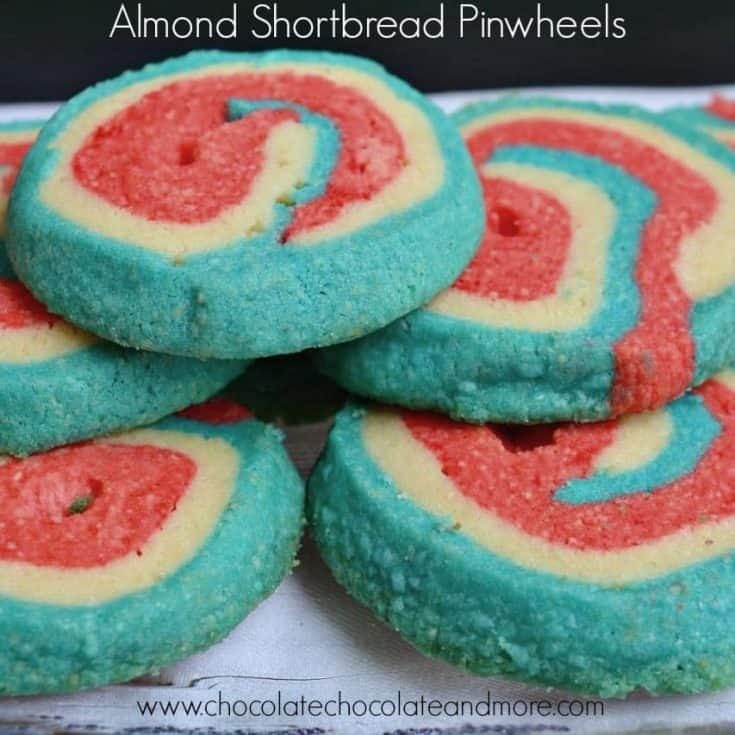 Almond Shortbread Pinwheels - Chocolate Chocolate and More! Almond Shortbread Pinwheels combine ground almonds with traditional shortbread for intense almond flavor in a buttery cookie. Color them red, white and blue for the Fourth of July or Green and White for St. Patrick’s day, or Green and Red for Christmas. I went to Macau a few weeks ago. It’s mostly known as a gambling location because they make more money on their casinos than all the casinos in North America combined. I’m not much of a gambler. I was there for a conference but I do like history and culture and Macau has an interesting mixture of both. It was a Portuguese colony and the Portuguese intermarried with local women. The result is a mixture of Portuguese and Chinese culture that is very unique. This cultural interplay is most obvious in the food. Fresh ingredients with a variety of local spices make for some very tasty dishes. I think I gained 10 pounds in the 5 days I was there. One specialty was Chinese almond cookies. We stopped by a place that makes them all day so the samples were still warm. 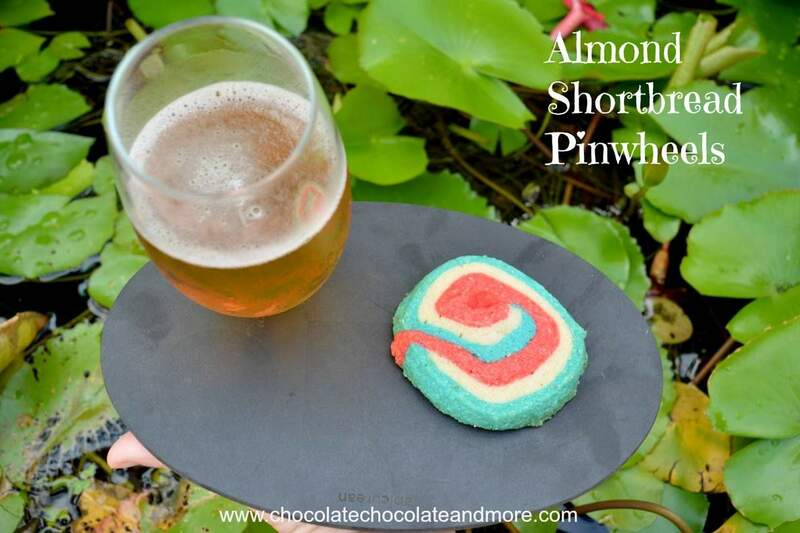 They are shortbread cookies with intense almond flavor. 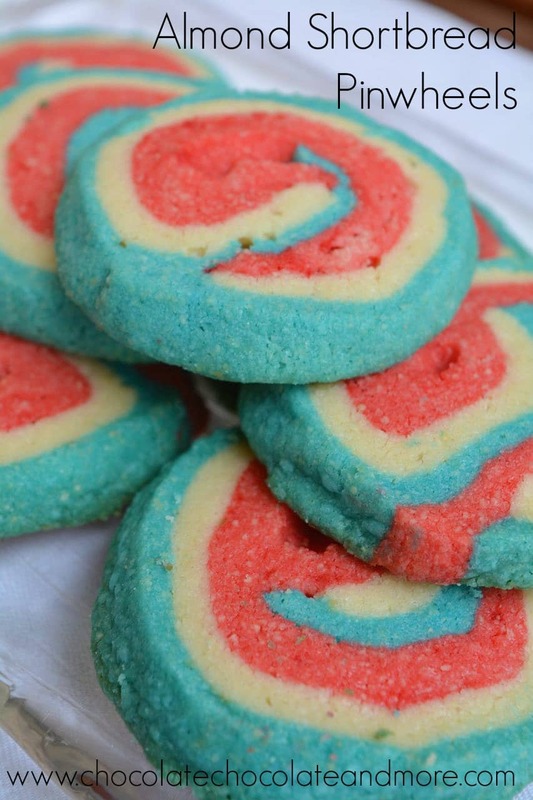 These pinwheels are an attempt at recreating those cookies. The dough softens up pretty quickly even when it’s refrigerated so I rolled each layer between two sheets of plastic wrap. I refrigerated them for about an hour after I rolled all of them out. Then I took the top layer of plastic wrap off the blue layer (my outermost layer) and off the white layer. To get the white layer on top of the blue one I folded one edge of the plastic wrap over the top of the white layer and rolled it up. Then I turned it over so the exposed end was lined up with the edge of the blue layer. Think of it like a toilet paper roll with the paper going over the top. I carefully unrolled it onto the blue layer and removed the plastic wrap from the top afterwards. I repeated with the red layer. Now I had three layers with 1 sheet of plastic wrap on the bottom. I used the plastic wrap to roll the pinwheel together and wrap it so I could refrigerate for several hours before baking. I’m also very excited about our next giveaways. 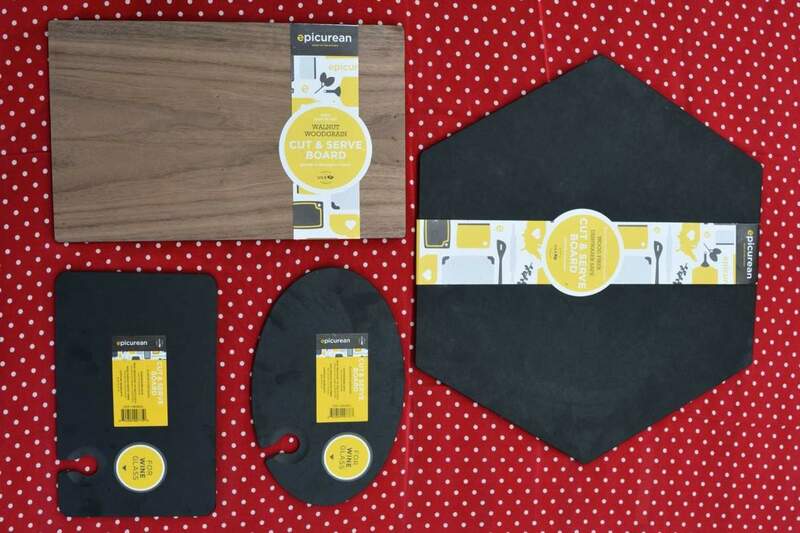 Epicurean is an American company that produces high quality cutting and serving boards from ethically sourced wood. They’re beautiful and functional (dishwasher safe and heat resistant). I love the cocktail plates! They’re light weight but look like slate. If you’ve ever juggled your wine glass and food at a gathering, you’ll really appreciate these. You just slide the stem of your glass in the slot and you’ve got portable food and drink! We’ll also be giving away display boards and a cake stand. I’m just firming up the dates so we’ll post the first giveaway very soon. Blend butter and sugar together. Add almond extract. Then mix in ground almonds and flour to make a soft dough. Divide dough in thirds. Add blue food coloring to one portion, red food coloring to the second and leave the last portion white. Wrap each portion in plastic wrap and refrigerate for at least 1 hour. Roll out blue dough between two sheets of plastic wrap. You want a rectangle about ⅛ inch thick. Repeat with white and red dough. Refrigerate the layers for about 1 hour. Remove the top piece of plastic wrap from both blue and white dough. Carefully use the other piece of plastic wrap to roll the white dough up. I folded the end of the plastic wrap over the end of the dough and rolled so the dough would not stick together. Then unroll it on top of the blue dough and remove the plastic wrap from the white dough as you go. Repeat this process with the red dough. You will have blue on the bottom, white in the middle and red on top. The blue layer will still be sitting on top of plastic wrap. Use the plastic wrap on the bottom to help roll the dough into a spiral and wrap the roll in the plastic wrap. Refrigerate several hours. Heat the oven to 300°F. Slice the roll into ½ inch slices and place the slices 1 inch apart on parchment paper or silicone lined cookie sheets. Bake 25-30 minutes. Cool on racks.